Looking for the best dropshipping niches of 2019? Well, I've got good news for you. 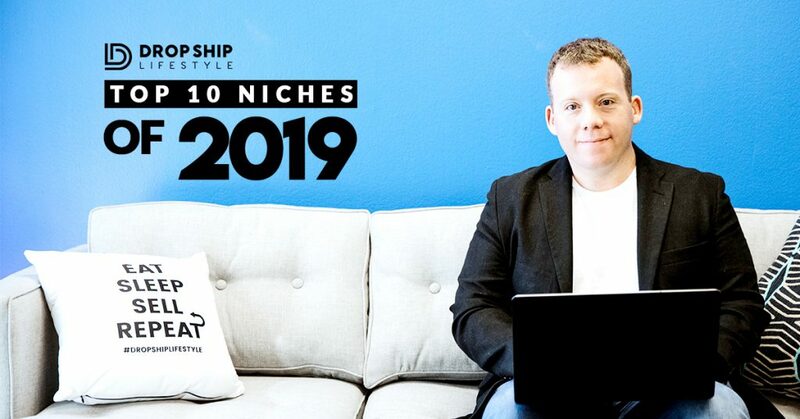 Not only am I going to give you the complete list for 2019’s most-profitable drop ship niches, I'm also going to give you my top ten niche list from the previous four years! If you would prefer to get the best niches of 2019 in video form, just click play on the video below! Moving into 2019, we're heavily focusing on brandable drop shipping stores. That means we need niches that give us multiple opportunities for monetization. While it's still very possible to make a lot of money with niches that only provide the opportunity for one-off sales, I do believe that as we move into the future, the more opportunities for monetization, the better. Build a brand around travel where you can drop ship minimalist luggage. Add in another revenue stream by doing brand deals with travel companies and promoting flights as an affiliate. Build a brand around gaming where you drop ship desks, mounts, and gaming chairs. Add in another revenue stream promoting PC parts as an affiliate. Increase your brand reach by virtually building e-sports stars’ gaming computers and share details on how visitors can recreate them for themselves. Similar to home gaming setups, you can drop ship desks, mounts, chairs, and even treadmill desks. Build a brand around productivity and add in additional revenue streams by promoting project management software. Add in another revenue stream by promoting business conferences that focus on productivity and results. Drop ship weights, bars, stationary bikes, and kettlebells. Then build a brand around getting fit in the comfort of your own home. Promote the fact that people save time and money in the long run by not having to commute. Add in another revenue stream by promoting home meal delivery services, in-home personal trainers, and instructional exercise videos. Build your brand’s reach by sharing meal prep and workout videos on your online store. It’s not too late to cash in on the tiny home trend! You can drop ship all of the furnishings that tiny home builders need. Increase your revenue streams by referring clients to tiny home builders! Shutters, blinds, shades, curtains, drapery… you can drop ship all of these products while making a great profit margin! Add in another stream of revenue by partnering with interior designers and sending them referrals! Build a brand around recreational boating where you drop ship replacement parts and upgrade options for boater owners. Add in another stream of revenue by doing brand deals with boat manufacturers, promoting boat shows, and promoting boat insurance as an affiliate! Build a brand around home theaters and drop ship the projector screens, the mounts, the seating, the shelving, and the popcorn machines! Increase your brand reach by showcasing different home theater setups for different size rooms. Add in an additional stream of revenue by referring clients to home theater installation companies and also by promoting the electronic components as an affiliate. Cash in on the growing cannabis industry by drop shipping indoor grow rooms, lighting, and related accessories. Increase your brand reach by sharing “how-to” videos. Add in another stream of revenue by doing brand deals with industry events. This is a niche that is continuing to grow with no signs of slowing down. Drop ship the kiteboarding gear and start creating content to build your brand now. Kiteboarding will be in the Paris Olympics in 2024 which should cause a huge boom in sales. Do the work now and be positioned for even more success in the future. Keeping long-term strategies in mind will not only help bring in a consistent cash flow but will increase the value of your store over time. Meaning, if you decide to sell your store, it will be worth more. That’s why 2018 was the year of the Repeat Purchases Niche. With these dropshipping niches, you’ll be able to acquire customers that will buy from your dropshipping store for years to come. This means you’ll have a much higher customer lifetime value and a higher ROAS (return on ad spend). ​In 2017, we focused on passion-based niches that you can create Facebook groups around and become a leader in. If you build a thriving community around your products you’ll get a ton of organic and referral traffic, which means you’ll be able to sell more to your customers! These ten niches are broad while still being specific. Meaning there are a lot of associated products you can sell with/after they purchase your main offer. Which means you’ll have huge upsells on the main offer AND be able to continually sell to them after! So what niches are perfect for building Facebook groups? Spelunking: It’s a competitive hobby, think photo bragging rights of “who climbed into that really really small hole”. Plus it’s usually a group activity. Survival Prepping: Think “Doomsday” preppers. Exotic Pet Supplies: People, LOVE their pets, and they also LOVE talking about their pets. RC Cars & Planes: Not just for kids. Adults pay some serious bucks for this niche. Rock Climbing Equipment: Also a group activity. Many rock climbers join local climbing Facebook groups to meet fellow climbers & talk “rock”! Lawn Care: These are the type of people who win “Lawn of the Month”. Robot Building: Another expensive “toy” for adults. There are even robot competitions! Bio-Hacking: Huge trend that has grown in popularity over the past few years. Amateur Photography: So many accessories to talk shop about: light boxes, stands, green screens, filters, etc. With these ten niches, you can build up an active Facebook group that your customer will love to interact with. More importantly, you’ll have a brand that they’ll love to buy from! 2016 was the year of the upsell. We chose niches that make you more money through selling add-ons with your main product. That means you make even more money per transaction. 2015’s top ten dropshipping niches were all about hobby niches. People are passionate about their ​​hobbies and will gladly spend top dollar to support that passion! The best part? These passionate people can be targeted over and over again with new content that can be loaded into your email autoresponder. You can target the same customers repeatedly by delivering real value that they’ll love and want to share with their communities. For you, this means less advertising costs, more qualified traffic, and more loyal customers. These dropshipping niches have a lot of opportunities to use smaller offers for building trust with your customers. That way they’re comfortable buying your main offer. Also, you can make some great free content with these niches to attract potential customers. Now you have 50 of the best and most profitable drop shipping niches from the last 5 years! With these ideas, you can get started creating your own eCommerce store. And finally, live the lifestyle you’ve always wanted. Love you content and I am big fan of your podcasts. I listen to them everyday while I commute to work (makes the train journey a learning time which is great). I had a question around seasonality, you meantion not to choose a niche that is seasonal yet you picked Kite & Boating as a nich for 2019. Aren’t those considered seasonal? I liked at Google trends and would say 50% is up and 50% of the year to drops. Again thank you for all the value you have given us. All the best with the new move and house! Regarding seasonality and the niches listed, you’re correct there is variance on how they trend based on the time of year. However, I give examples of what seasonal charts look like in the Drop Ship Blueprint and the niches that are truly seasonal have much more extreme peaks and valleys than what you’ll see for kiteboarding and boating. Great article. I’m thinking of dropshipping Curley hair products – any thoughts? Also any thoughts on how to go about locating those suppliers. Any advice from you would mean the world to me as I am just starting out . Many thanks. All the best to you. Regarding dropshipping those products, it really depends on how expensive they are and if shoppers in that industry have any brand loyalty. I like the idea of minimalist luggage, but would that be hard to find priducts that fit the price range you recommend? Also do you think home decor is oversaturated? I have always been into aviation and want to become an aviator some day so I was wondering if there are some good aviation related niches you could suggest? I don’t know that industry so I really can’t think of anything off of the top of my head besides RC planes and/or replacement parts/upgrades for small aircrafts. That may be a niche that is trending… however, the price point is just too low. To make any real money you would need thousands or tens of thousands of orders per month. That’s just too much work for too little money. What do you think about essential oils as a niche? Too hard to acquire customers profitably at that price point. Espeicallly when drop shipping. I am thinking of a Dolls niche shop. all type of dolls, dolls clothes, dolls accessories… what do you think ? The price sounds like it would be too low… however, I’ve never researched the niche before so I can’t say for certain. Are there products/bundles that sell for over $200? Why is the focus regional. Why arent you encouraging your students to sell worldwide…why focus in the US if you reside in the US? That is because most of the items we sell are large and heavy. The cost of shipping them overseas is often greater than the cost of the products themselves so it just doesn’t make sense. What are your thoughts on 3D printing supplies? I’m a little confused. I see pottery/ceramics as being a top niche but when I search “pottery” on google trends it seems to be a seasonable niche, which would be a no go for a first time store, correct? If you check trends for the past 5 years you will see that there are small spikes around the holiday season. However, I would not consider this seasonal. A trends report for a seasonal niche will show huge peaks and valleys each year (meaning next to no sales in the offseason). You can search hammocks and check that chart for reference of a niche that is truly seasonal. Thanks for sharing your knowledge and research with us! It’s really very helpful for newbies to get the right niche idea from your niche list given. Nowadays I am stuck between 2 niches. 2. Problem solution tools (kitchen problem solutions, bathroom problems, vehicle washing tools, gardening tools) etc. Glad you got value from the post! My advice is to stay away from apparel. It has a very high return rate and it’s not worth your time when just starting out. Without knowing much about your business, my advice would be to get off eBay on bringing your store and sales onto Shopify. If you sold commercial deep fryers you could sell oil. If you sold commercial blenders & drink machines you could sell glassware. If you sold buffets you could sell food trays. Nice research Anton Kraly. The top 10 Niches from 2015 to 2018 are here now. These are 100% genuine list. I will begin to keep following your blog. Good job. Please keep sharing. We have many successful students in London and it’s never too late to learn something new! If you’d like more info on the Drop Ship Lifestyle System I’m hosting a free training webinar this week that you can attend. You have covered different niches in different years. Thank you for sharing this list with us. Hello, looking to see if Shopify is the best platform to use for drop shipping. What your opinion? ?% it’s the easiest to use, the most secure, the easiest to customize, and they have the best support. do you have any smaller package deals? Honestly, I really think your Done For You package is a great deal…. I’ve never researched these niches so I cannot give you a concrete answer… a good first step would be to make sure they meet my niche selection criteria. is there any specific niche categories for Indian eCommerce bussiness. My advice would be to use this list of niche and to do business in the U.S. I am currently folling your free Drop Ship Lifestyle mini-course and am excited every day to get the next module? I’m assuming at the conclusion of the free mini-course will be an option to become a student of yours by “purchasing” your more in depth courses. Will you offer an option to make 2-3 pymts or will the pymt be due in full only? Good info, is it possible to dropship from kenya? How to add product photos to our website? When order is placed in our store How to transfer order to supplier? Add photos to Shopify is extremely easy… we show you how to do this in our Shopify Video Course but this part is also very simple to figure out on your own. Many thanks for sharing this article, Anton! Thinking of getting serious with dropshipping, good thing I checked here. Found a few niche ideas that resonated with me. That’s Nice Direction For Selection. My Advantage is Sunglasses，How Can I Find The Reseller? Nice article, excelent information to prepare my business for next year!! Thanks for sharing these great niches with me. You’re welcome! And be sure to also get my 76 page PDF report that shares 187 drop ship friendly niches! eCigs would be a no go because it will be next to impossible to get (and keep) a merchant account in good standing. Fridges could be good, but you’d have to do the research to confirm! I teach this in Module 2 of the Drop Ship Blueprint. Thanks for sharing, well come to Viet Nam Anton! Your only problem would be getting a merchant account. However, you can use Stripe Atlas and that would work. Hope that helps! You’re welcome Kris! Glad to hear the niches are helpful to you! Great niche ideas! Definitely worth analyzing and give a try. YES SEND ME YOUR 10 MODULE TRAINING FOR DROP SHIPPING. THANK YOU .